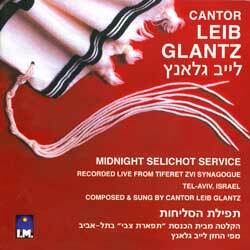 Notes Leib Glantz composed and sung this live recording of the 'Midnight Selichot Service.' It is broadcast annually to this day on Israeli National Radio on the eve of the Selichot holiday. Cantors and Musical critics from all over the world consider this as the greatest cantorial work ever to be composed or recorded.